Japanese export growth picked up for the first time in nine months in November, in part due to a weaker yen, official figures have shown. Exports grew by 9.1% compared with a year earlier, the finance ministry said, compared with 7.8% in October. 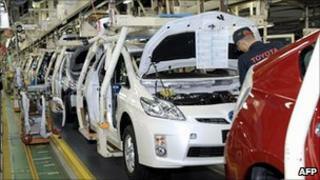 However, analysts remain concerned about the strength of Japan's economy. Also on Wednesday, the government forecast economic growth of 1.5% next year, a sharp fall on the 3.1% it predicts for this year. It also forecast that consumer prices will stop falling - they have been on a downward spiral for 20 consecutive months. However, this would not mean the battle against deflation is over, the government said. Deflation is particularly damaging to economic growth because it undermines consumer demand, as individuals tend to wait until prices fall further before making purchases. Despite the improved November figures, analysts remain unconvinced that export growth can be sustained. "As the global economy is clearly slowing, although it is not deteriorating, Japan's annual export growth may turn flat between January and March, which would weigh on the economy's growth," said Takeshi Minami at the Norinchukin Research Institute. He warned that if the economy does slow, "the government could hardly do anything about it, with little room left to boost fiscal spending". Last month, the government passed a $61bn (£39bn) stimulus package, the latest in a series of measures designed to boost the economy by creating jobs. On Tuesday, Japan's central bank kept interest rates at between zero and 0.1% in order to boost the country's fragile recovery, while in October it announced a 5tn yen ($60bn; £40bn) asset purchase scheme designed to boost demand. Japan's economy expanded at an annual pace of 4.5% between July and September, but many economists attribute this relatively strong growth to one-off factors. Most expect growth to be weaker in the final three months of the year.